Customers with queries about existing orders and returns or refunds can contact us by email to info@woodentoyshop.co.uk. We only deliver within the United Kingdom. We do not deliver to the Channel Islands, BFPO addresses or overseas. Orders must be placed before 2:00pm Monday-Thursday for delivery within 1 to 2 working days (Monday to Friday delivery). Orders placed before 2:00pm on Friday will be delivered on Monday or Tuesday, or on Tuesday or Wednesday on Bank Holiday weekends. Orders placed after 2:00pm on Friday, or on Saturday or Sunday will be dispatched the following Monday for Tuesday or Wednesday Delivery, except on Bank Holdays. Please note that our Express service does not support delivery to The Highlands, Islands or Northern Ireland..
We reserve the right to change our order and delivery deadlines in the event of adverse weather conditions, road traffic accidents or unforeseen incidents affecting our courier’s ability to make deliveries. All orders are dispatched via couriers who deliver between the hours of 7am and 10pm Monday to Friday and on Saturday if Saturday delivery has been requested. All orders have a tracking number and require a signature. During busy periods, such as the Christmas season, delivery may be attempted slightly earlier or later than this window. Please make sure that someone is available to take delivery of your order as we cannot be held responsible if our courier is unable to deliver your parcel(s) because there is no one available to sign for your order. If our courier is unable to deliver your parcel because you are out, you will either receive an email or a card will be left at your delivery address advising you to reschedule the delivery. 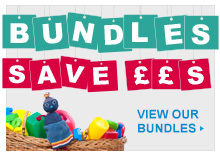 Please note, if you change the delivery address after your order has been dispatched, such as to a parcel shop, delivery can take an additional one to two working days. If you make a special delivery request, for example Please leave next door or Please leave in the porch, please leave with neighbour etc we cannot guarantee that our courier will follow these instructions when a signature is required. We advise against special such delivery requests, in particular those asking that parcels be left in open or public areas, in porches, sheds and/or outdoors. Similarly, deliveries to businesses, hotels or other addresses that you may not be the person signing for the delivery are not advised. Any such special delivery requests are entirely at your own risk, you assume full responsibility and we cannot be held responsible if you do not receive your order. Our couriers will email you and/or leave a card if no one is home when they have tried to deliver your order. You are responsible for coordinating your delivery with the courier if you are not home for them to deliver. Our couriers will make 2 attempts to deliver your order, a 3rd delivery attempt can be made but you will need to contact the courier within 24 hours of the previous delivery attempt to schedule this as it is not automatic. After 2 attempts if you have not reschudeled a 3rd delivery or after 3 attempts your order will be returned back to us. There will be a charge of £8.50 for the return which will be deducted from your refund in addition to the outbound delivery charge. Incorrect Address/Delivery Details: you are responsible for ensuring that you provide the correct address and postcode for delivery. If you make a mistake when you place your order please contact us immediately. If your order is delivered to an incorrect address because of mistakes made on the address you assume full responsibilty. If our courier returns an order because you made a mistake with the address, postcode or delivery address your order willl be returned to us and the £7.50 returns charge by the courier plus the outbound postage charge will be deducted from your refund. Our couriers notify you by email and text message (if a mobile numer has been provided) when they will be delivering your order and when it has been delivered. You must notify us either by email or telephone within 48 hours of being notified of delivery if you have not received the delivery or if the order has been delivered items are missing or damaged. If your order has not been received within 6 days of placing your order please contact us so that we can have our courier firm trace the package. We cannot accept claims for missing orders more than 6 days after the date of order as the courier firms have a 7 day limit on filing claims which starts from the date that we dispatch an order. Please contact us if you have any questions about delivery or any other questions at all. We’re here to help. If you have a particular delivery deadline, we recommend you select our Express Delivery option. Unfortunately we do not deliver to the Channel Islands, BFPO addresses or overseas. 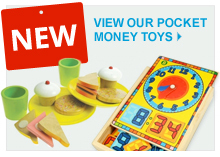 At WoodenToyShop.co.uk, if a toy is displayed as In Stock, then you can be sure it is in stock. If we don’t have the toy, we won’t take your money. Occasionally we discover that items have been miscounted in our warehouse and are no longer in stock. If this happens we will refund your order immediately or send you any missing item(s) as soon as we have new stock - whichever you prefer. A full refund on all purchases: if you are not fully satisfied with any of your purchases you may return them to us within 30 days for a full refund. We do not pay for the return postage costs. When returning an item please include a copy of the packing slip included with your order and write on it if you would like to exchange it or receive a refund. Duty of Care. Customers have a duty of care towards all products during this time period and we advise that goods are returned with their original packaging to ensure that they are not damaged in transit. We recommend that you use a tracked signed for delivery service and ensure that your courier of choice has adequate compensation coverage to reimburse you if your return is lost or damaged. We reserve the right to reduce the sum refunded for goods which show evidence of use beyond the handling required to inspect items to ensure that they are as expected. As a rule of thumb, this means that you can inspect the goods as you would in a shop and return them in the same condition that you would expect to receive them. Missing or Damaged Items: You must notify us in writing by email or telephone within 48 hours of receiving your order if items are missing or damaged. If your order has not been received within 7 days of placing your order please contact us so that we can have our courier firm trace the package. We cannot accept claims for missing orders or missing items more than 10 days after the date of order. Faulty, Damaged Goods or Missing Parts - If a part is missing from a product, or a part is damaged, then a replacement part will be sent rather than an entire new product. In such cases there is no need to return an item. If you are able to send us photographs of the fault or damage we may be able to to replace the missing or damaged parts or items without asking you to return them to us. Please contact us by email to info@woodentoyshop.co.uk regarding faulty or damaged items.. If you have any queries regarding returning any of your purchases please contact us via email at info@woodentoyshop.co.uk or refer to the information and instructions below. Please return your order to the address shown on the front of your invoice or packing slip. Please retain proof of postage for your return. This will allow you to track your package if it fails to arrive on time at our returns centre. Refunds are processed within 30 days of receipt of your return at our warehouse. (In practice refunds are generally processed within 7 days of receipt.) During November and December returns will take up to 30 days to refund.